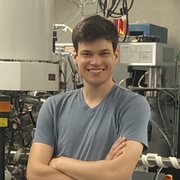 Materials Science and Engineering graduate student Alexander Pearse is the first-place winner of the 2017 Dean's Doctoral Research Award competition for his research, "Development of Vapor-Phase Deposited Three Dimensional All-Solid-State Batteries." Pearse is advised by Distinguished University Professor Gary Rubloff (MSE/ISR). Clark School Dean Darryll Pines wrote that these "research accomplishments are a testament to the level of scholarship produced by Clark School students and faculty." The first place winner will be added to the plaques in Martin Hall and in the Kim Building.